Externalized-Self-Gaze in Japanese Martial Arts, a photo by timtak on Flickr. Noh Master Zeami points out that to master the art of Noh drama one must, through repeated attention to mimicry and form, cultivate a "Riken no Ken" (離見の見, see Yusa, 1987), a sort of out of body experience of Self. Miayamoto Musashi in The Book of Five Rings (五輪書）says that the swordsman must learn to become and thus see himself from the point of view of his enemy (敵になると云ハ、我身を敵になり替りておもふべきと云所也). 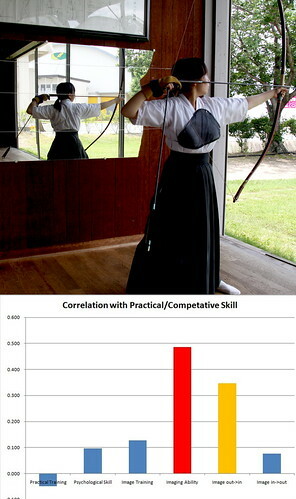 And in kyuudo (the Japanese art of archery), as demostrated by my seminar Student Ikki Yamamoto (2009) in this graduation thesis, nothing is more correlated with kyuudo performance than the ability to see oneself from the outside. To achieve this end practioners of kyuudo practice form incessently, in front of mirros, using a sort of catapult device before they are even allowed to pick up a bow, and with a sort of brace to ensure that their feet are in the right position. Through minute attention to form, and repeated mimicry of set positions, they gradually become so aware of their form　that they are able to see it from what might be called a "third person perspective," or equally, an externalised self gaze. This ability to see oneself from what Mc Veigh aptly calls the poisition of an "invisible spook" (Wearing Ideaology, 2000) correlates most highly - more than frequency of psychical training or psychological skills and traits such as power of concentration, or desire to succeed, with the ability to do, and win at kyuudo. I liken the Japanese martial, and Noh, "Path" (michi, 道, dou, do) to a 'different kind of trancendental dialetic." There are those such as Hegel, Plato and Lacan in the Western tradition that one can discourse ones way to a sort of higher plane. By stepping further and further back from the subjective position, one can, they claim, achieve a depersonalised, truer, transcendental. A similar thing may be going on in the Japanese martial arts. Yamamoto, I. (2009) "Mental Training: Self Image in kyuudo." Unpublished Gradutation Thesis, The department of Tourism Studies, Faculty of Economics, Yamaguchi University.